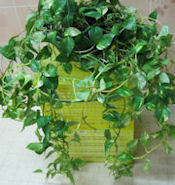 Pothos are vigorous trailing plants that can grow to 10 feet in containers. 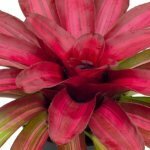 They are easy-care houseplants which tolerates low light, dry air and irregular watering. In all, they are undemanding and hardy, perfect for the home or office and can be grown in soil as well as water. They make wonderful, attractive hanging baskets and accent plants that cascade down. Plus, they add charm and vitality to a room when trained to grow up poles and around windows. They also make good ground covers for large containers usually seen in business offices and shopping malls. Photos can be variegated with white, have leaves and stems with a yellow hue, be pale green and cream, or be a become a "green-only" plant when kept in low light conditions. 1. Jade Plant - the leaves are green evenly. 2. Golden Plant - there are yellow patches on the leaves. 3. Marble Queen Plant - Leaves are highly variegated with white and requires bright light to keep its variation in color. This plant will not grow well in low light and will become a "green-only" plant. These plants are very antagonistic against formaldehyde which is found in foam insulation, particle board, and pressed wood products. It also counteracts benzene which is found in nail polish, paints, solvents, and adhesives. Light: Low to bright indirect light. Soil: All-purpose well-draining potting mix. Water: Water thoroughly and remove excess water, let soil dry out completely between waterings. If left continually in damp soil, the roots will rot and your plant will die. When it starts to droop, it's time to water. Monitor your plant and give them a good drink of water when it starts to droop. Fertilize: feed monthly to bi-monthly, with any balanced houseplant fertilizer. Pruning: Cut back to a leaf that is about 2" from the base of the plant, to promote new growth. Pinch plant as needed to shape or control the size of your plant. Re-Potting: When the roots begin showing through drainage holes, the leaves will droop no matter how much or often you water them. Repot in a pot 1 or 2 sizes larger with fresh soil. Propagating: Plant is very easy to root from cuttings. Place cuttings in water or put the cuttings in damp soil to root. Pests: Plants are usually pest free, but they can get infested with mealy bugs. If you see them, spray plant with insecticidal soap or dab bugs with an alcohol soaked cotton swab. Pothos plants are low maintenance and make a great accent to decorate the home, but they contain calcium oxalates which is toxic. 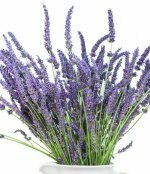 Plant can cause irritation and vomiting if ingested, and the sap from the plant can cause dermatitis and allergic reaction in sensitive people. Keep out reach of children, cats and dogs.